So, What Actually called Online Form filling Jobs? It’s actually a simplest copy paste jobs where you suppose to work both online and offline. Most of the forms filling jobs are based on internet and after completing a form filling you have to submit data online. Offline form filling jobs is still available, but not so popular. Let me show you how this both type of form filling work to operate. How to work in Online Form filling jobs? 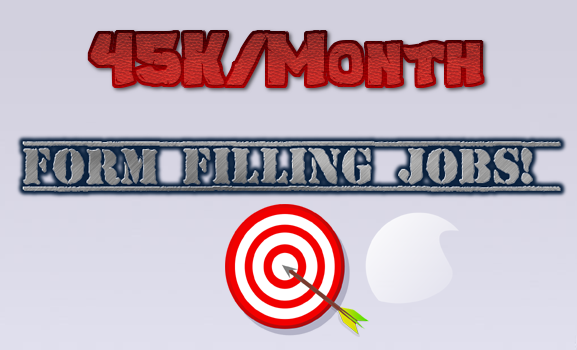 Getting started for online form filling jobs is not a big challenge. You have to make sure that in your home computer and internet connection are present. Next find a genuine form filling jobs and make yourself sign in. Now the concept is simple for every online form filling jobs provider, you have to login into your member area and click on start new work. Now you can able to put record into a new form, below or may be on the top of each form you can find Data to copy. Now hover your mouse on appropriate data and paste it into the form. Next, by continue the same process you may have to copy paste 10-15 record into the fields. This all most done, now click on process to submit your data and here you done. Its almost similar like copy paste jobs. 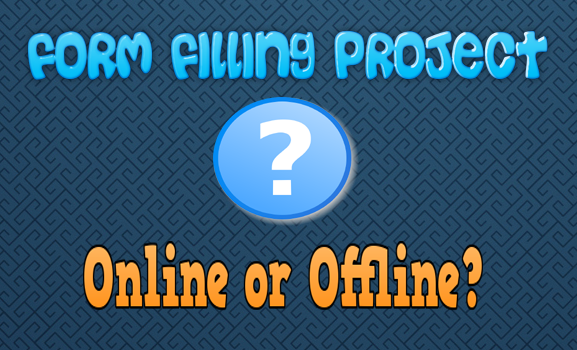 How to work in Offline Form Filling jobs? So you have no internet connection and you want to start offline form filling jobs right? Here you have to download work files from cloud file sharing server or directly collect work CD from online jobs provider. These types of work are based on month target base, and you have to complete the whole project within 25 -28 days. The work process is merely deference , in most common either you have to login directly into that CD and after completing the form filling work you have to save those data into your computer hard drive. Make sure to take care your work not be corrupted, in case you have corrupted files into your work you may lost your entire work and payment. Note: 10 Software that protect your Online Jobs work to be corrupted. First of all you can’t work this form filling jobs without computer. Make sure you have standard computer with browser, internet connection, teamviewer and Microsoft office installed. You may notice that online form filling jobs is a combination of copy paste work. So we recommend using quality keyboard and mouse set up so that its wood not troubles you. Don’t Confused about Ad Posting jobs and Form filling Jobs! I have seen many website on the internet offering online form filling jobs but they actually paid their customer for doing ad posting jobs. Please note ad posting jobs is much appreciates work then online form filling jobs. So why should you take less payment of Rs-1.5-3.5 while people are earned up to Rs-10.00 per ad posting. Anyway as per my experience the reason why people should join form filling jobs instead of ad posting jobs is to circumvent the hard technical part of classified ad posting jobs. So any one assure you to make you get register for online form filling jobs and after paying the registration fees while you see that its actually an ad posting jobs , then you fell oneself as victim of scam. Who Provide Genuine Form filling jobs? The most complicated question for online earner is how to get a genuine form filling jobs? In India almost 100+ website now offering form filling jobs but few of them are real. So you should join a reputed online jobs provider such as CYBER EXPO , Surejob.in or moneyconnexion.com, hence if not likely to this recommendation you can consider this tricks in order to find genuine form filling jobs provider company. Tips to Avoid Scam Form Filling Work! Make sure the company is ISO Certified. Don’t forget to check proprietorship and owner information. Don’t consider any form filling jobs provider as a Legitimate unless you have verify contact phone number and valid office address. Check Domain age and if you found the domain is just register and age not more than 3 year better to avoid those website. Check demo form filling jobs and don’t join unless you have fully understood the procedure of form filling project outsourcing. Some of company making people fool by creating fake project assignment and software beware from them. Try to take with the existing member, asked then how they work and how much amount does them earning from Desire Company. It will be smart decision if you can asked them to send few members payment proof and legal agreements copy into your email as proof. Is Form filling jobs is daily payment? If you join CYBER EXPO then you have the way to get daily work daily payment form filling jobs, hence instead of CYBER EXPO there are few more company are present online with daily work daily payment form filling jobs. How to be successful while doing online form filling work? Time and work are the circumstance to get success in online form filling work. First of all you have to decide whether you are going to working as full time worker or just a part time earning opportunity! Monthly Expected Earning Amount- 3,000 -8,000 INR. Monthly Expected Earning Amount- 8,000-25,000 INR. Monthly Expected Earning Amount- 1, 00,000 INR. Employee- 3-7 qualified professional guys will be ideal. This type of form filling jobs has no scam report yet; you can contact your municipality to outsource such jobs. In average on every 6 month Gov. start new project to get started report human resource. You work will be very simple , you have to convince municipality authority in order to outsource it , Basically no investment need but you may expect a little corruption that cost you pay a little amount. Now you will be provided thousands of hard copy of survey sheet, this is the sheet that used to make door step survey and entered by handwriting. So you work will be excelled each entry and create a chat report for Govt. higher admin authority. This it, for each 5-10 record entry you will get paid 40p-80p. Recommend Read: How to Earn from Google consumer surveys? How to start handwriting jobs from home? Classified submission is the oldest way to promote small business, many of small business owner like to post their business/service ads into classified site that issue satisfying sales query. You can call this as ad posting jobs. But we never recommend to work as ad posting jobs while you are sing up as form filling jobs, if join in ad posting jobs in CYBER EXPO you will get paid on average Rs-10.00 and in online form filling jobs will get the same work with less payment of Rs-2.00-Rs-3.00, So it’s painful to work such Classified submission jobs while you are pay so much less amount. Recommend Read: Ad posting Jobs? Is It a Scam or Legitimate System? 4 Biggest Mistakes That Can Ruin Your ad posting jobs! Ad posting job Review : How I Made 65,000 from India? You can directly subscribe CYBER EXPO’s online form filling with daily bank payment. CYBER EXPO are now outsourcing for Private sector bank project and FI project form filling work that based on new account opening , also CYBER EXPO work as a corporate CRM Migration , where you have to entry customer database into online zoho CRM . Freelancher.com is an another way to get found for online form filling jobs. If want to work on temporarily base without any investment why not get register your name on Freelancer.com. Here almost 550 plus Register Company to hire and waiting to make you involve starting part time online form filling jobs. Each project has new adventure and work experience. On average you can earn up to $5-$500 form Freelancher.com by assignee free form filling projects. It’s an easy way to earn money online. You have collect 100-500 link submission website list and by register your name and email address you can fill form to submit links. (Website address) This are called marketing stand where you will get paid on per successful link submission. Link submission (wiki) help a website grow more backlink and SEO Score. Atyati-Genpact are into contact to manage FI project of, UBI, BGVB, UCO, IDBI. This are the business bank included in this project. If you have small NGO you get this project. The instant invest is nil as Atyati-Genpact has in a contact for software and hardware support. It’s an another popular Online form filling jobs , you have to collect 1000+ forum posting site list and start discussing to get a backlink into a particular website. Hence if you found any existing topic into a forum that already exist you can just update without spamming text and put URL in order to get back link. Whenever we put any keyword on search engine we found search result with website URL and page title. Now thing instead of Google we have more than 250 search engine to deal. So many of small business owner like to get register their website address into all popular search engine so that people can find them more easily. So you are well skilled for form filling work , you can start online Search Engine Submission jobs by filling form given website nature and required information. Social bookmarking allow user to save, edit, and bookmark web document into their social sites. Its help them to access their entire favourite web contest anywhere anytime. Hence another way that Social Bookmarking helps a website is grow SEO score. On internet you can find lot of Social Bookmarking website that only need to collect and fill out form with website address, this type from filling jobs make you paid Rs-1.00 on per Social Bookmarking. Yellow page is a some type of business listing page where you can put your business or shop listing and get found by local search. These types of B2B website are very popular to advertising local business. You can collect up to 50+ such website and fill with local business data. This type of local yellow page listing may pay up to Rs-10.00 on per successful form fill up. It’s is true that there is more scam are there in offline form filling jobs more than online form filling jobs! After reviewing 10-15 offline form filling jobs we found that most of the scammer send fake CD that contact same form and data to fill out the record , and a software for user interface, The work is very simple you have install form filling software and copy-paste date into given form and submit finally. But such job has no reality and way to earn money. Better to avoid any type of form filling project that process through CD. Let me know how I did? Is my online form filling jobs review is helpful to you? Also let me which of form filling jobs did like to start out of my 10 recommend? Also if you want to discuss or like share some of your experience let us know by do comment below. Previous to Read: How to Earn 1Million by starting a classified website like olx/Quikr?